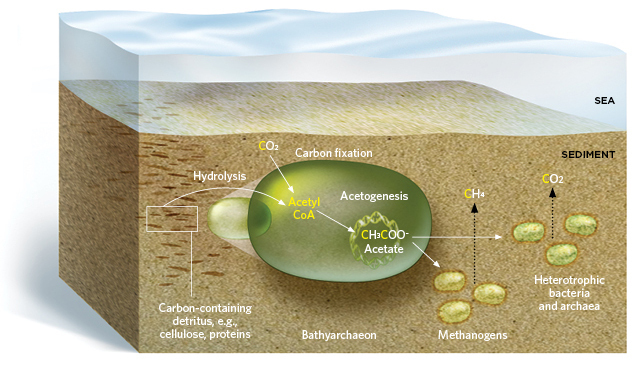 Researchers discover acetogenesis in archaea, suggesting an important role for these little-studied organisms in generating organic carbon below the seafloor. Y. 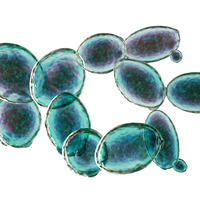 He et al., “Genomic and enzymatic evidence for acetogenesis among multiple lineages of the archaeal phylum Bathyarchaeota widespread in marine sediments,” Nat Microbiol, 16035, 2016. Wang was puzzled. Archaea have traditionally been thought of as extremophiles, living unusual lifestyles in unusual environments, such as in hot springs or the Arctic. Even though that view is changing as more and more studies identify archaea in diverse habitats, the organisms’ abundance in these sedimentary samples, collected from the Gulf of California, was a surprise to Wang, and she wondered whether perhaps they were performing an as yet undiscovered ecosystem function. Along with collaborators at Shenzhen University in China and the Woods Hole Oceanographic Institution in Massachusetts, Wang’s group in Shanghai used metagenomics to identify most of the archaea in their sediment samples as members of a phylum called Bathyarchaeota, newly established in 2013 by Wang and her colleagues and previously known as the Miscellaneous Crenarchaeotic Group. 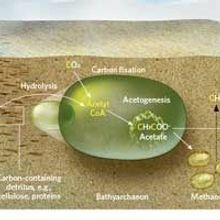 Analyzing the genomes of these archaea revealed several sequences that appeared to code for proteins involved in carbon cycling processes including, unexpectedly, acetogenesis—the production of acetate from inorganic carbon, a crucial step in biogeochemical cycling in marine carbon reservoirs. 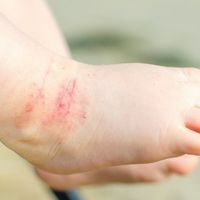 “It’s a really very interesting study because it highlights the importance of archaea in geochemical cycles,” says microbiologist Bettina Siebers of the University of Duisberg-Essen, Germany, who was not involved in the work. “It helps us to understand what’s really going on in marine sediments.” The next step, she adds, will be to try to grow these cells in the lab to perform studies on their function.